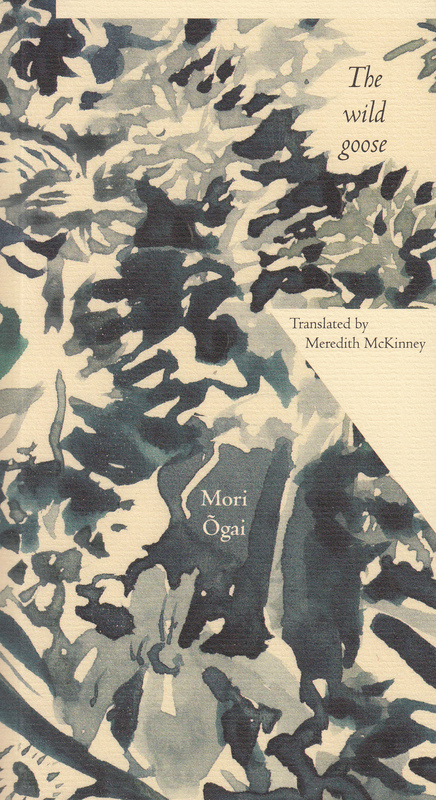 Finlay Lloyd publish beautiful books, and The Wild Goose by Mori Õgai is no exception. It’s a new translation of an early modern Japanese text, its origins captured in the cover design by Phil Day of Mountains Brown Press, and the same design on elegant paper leaves separates the novella from the introduction. Paradoxically, the book feels both delicate and sturdy in the hand, because while the texture of the boards feels like very expensive paper under the fingers, you know that the book is not going to fall apart with reading, as so often paperbacks do. The introduction by Meredith McKinney might have been written especially for me. I have read very little Japanese literature, and none at all from the early modern period when Japan was making hasty efforts to transition from isolationism after American ‘Black Ships” forced them to accept international trade. It was not an easy transition, apparently: there was a bloody civil war between supporters of Westernization and those who wished to ‘expel the barbarians’. At the time of Õgai’s birth in 1862 Japan was still officially ‘closed’ but within half a dozen years the new Meiji era had begun, and Õgai was, by the time of his adolescence, able to take advantage of the changes. He was obviously gifted in many ways, entering the Tokyo University Medical School at twelve years of age and graduating at nineteen. He studied in Germany and his fluency in German enabled him to read an astonishing array of Western Literature in German. This background in Western Literature positioned him in the literary forefront of the early modern Japanese era when he turned to writing. The Wild Goose (sometimes translated as The Wild Geese) was written in the period when he mostly wrote fiction based on his own life, but after that he wrote historical works and biographies. It tells the story of thwarted love, an opportunity lost for want of a nail. The novella (just 150 pages) is told by a young student who might easily be Õgai himself, but the story is revealed mainly from two points of view: the young woman Otama, mistress of a sleazy money-lender called Suezõ, and the student Okada who sees her through the lattice of her window and becomes attracted to her. (This ‘woman at the window’ trope reminded me of a story by Balzac, but I can’t remember which one that was). That Õgai understands the way the Western narrative tradition works, but is not wholly constrained by its patterns, allows the shoots of this story to grow along lines that become surprising to us while intrinsic to their cultural background. The interaction of these elements, combined with Õgai’s wonderfully perceptive insights into all his character’s motivations and internal responses to life, make this short novel a refreshing and moving experience for the reader. the impression that I have of J-lit is that it tends to have inconclusive plots, and is peopled by characters who are vaguely attracted to each other but never resolve or consummate a relationship. Characters tend to be polite and reserved to the point of cold disinterest, and their conversations are taut and brittle. Is this irony? Did Japanese authors like Õgai do irony? The biggest liar in the story is Suezõ who fobs off his suspicious wife with a litany of lies, but he is unabashed about this. So much so that I wondered why he bothered to lie at all. Apparently at this time it was quite usual for a successful businessman to set up a mistress for his pleasure, and since he despised his luckless wife, knew that she nowhere to go and that she would never abandon the children, it seemed to me that he was exactly the kind of man to flaunt his betrayal in her face. Otama’s betrayal is of a different sort. She’s been betrayed herself by her first husband, who turned out to be a bigamist. So while not enthusiastic about her liaison with Suezõ she submits when the go-between suggests that it’s a way of providing for her father in his old age. So she accepts Suezõ’s generosity (which never extended to his wife, of course). Otama has a house and servant of her own, and her father is set up in comfort around the corner. But once her worries are over, she becomes discontented and so emerges the fantasy of ‘the man through the window’ and her opportunistic attempt to make something of it. I find myself wondering about Japanese responses to this story at its time of publication. What were the ethics of a situation like this, where a woman is a product to be marketed by a go-between because she is no longer eligible for the marriage market? How would male and female readers of this novel react to the questions it raises? Fascinating stuff! Direct from Finlay Lloyd, or good indie bookstores everywhere. PS Finlay Lloyd has also sent me a collection of short stories by John Clancy, called Six. After Indigenous Literature Week I’ll be offering this book as a Giveaway, so keep an eye out for it when I do.